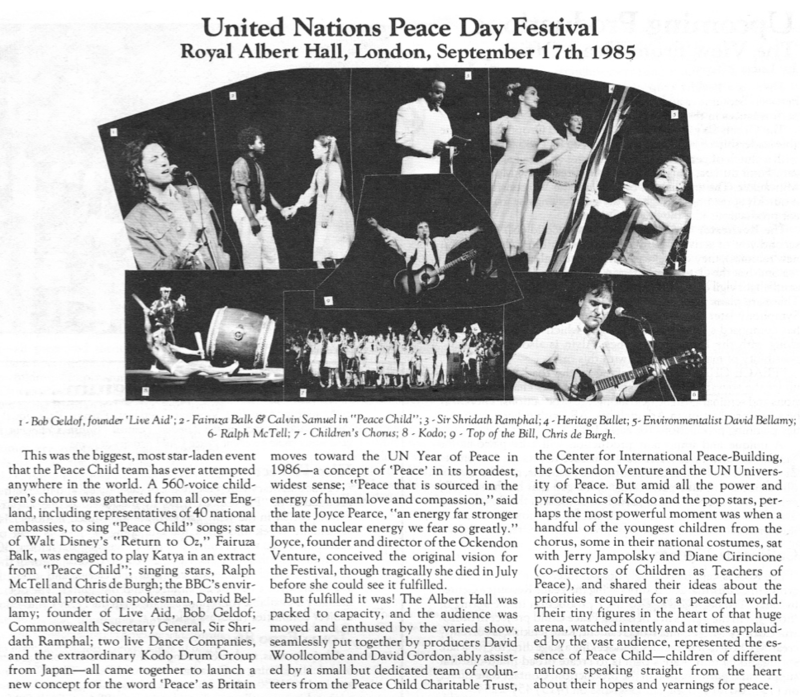 There are many moments in the extraordinary history of Peace Child that could lay claim to being ‘Our Finest Hour’: the extraordinary series of miracles that brought about the first performance in the Royal Albert Hall was one; the serendipities and miracles that enabled the US Premiere at the Kennedy Center was another. The extraordinary concatenation of events that led to Rescue Mission : Planet Earth being translated into 23 languages, selling over half a million copies and appearing briefly on the New York Times best-seller list was a third. Such achievements would not have been possible without the courage and effort of some truly extraordinary young people and some inspirational adults who supported and cared for them. You will read about them in the pages that follow. I salute them all, and thank them for their efforts. May you be inspired by them to similar efforts today as, clearly, we all need to do a lot of work to unite our nations and rise to the challenges of the 21st Century which are, if anything, more daunting than those of the last. Following the DC tour, and the Princeton and York PA shows, we were invited to do a performance at the Democratic Convention in San Francisco. We got a connection in Princeton to Warren Buffet’s wife, Susie – who lent us her San Francisco “2nd Childhood flat” – artfully decorated in with Peanuts wallpaper and furniture. We had a contact at the Marin Country Day School, George Manier – the music teacher whom we’d thought to use as MD. But when we met him, he urged us to use Steve Riffkin, as he was “younger, very talented, and with a strong background in musical theatre…” Steve became a legend! I cannot recall how we got the invitation to perform at the Democratic Convention: perhaps it was through Senator Alan Cranston’s office – or one of our supporters in the Bay Area. 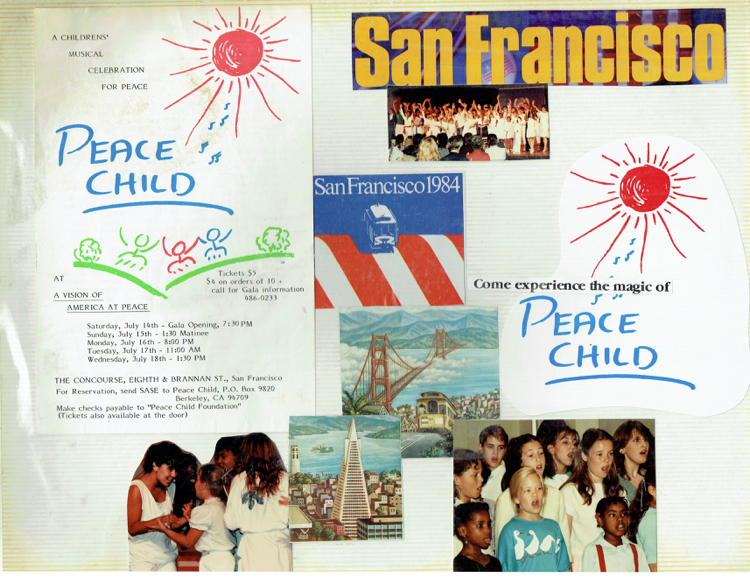 At any event, it was a golden opportunity to spend the Summer of 1984 in San Francisco – and nurture contacts and relation-ships throughout Northern California which would reap massive dividends for PCF in the years to come. Again, Rosey and I started doing the recruitment campaign – across the Bay Area. We had found a place to rehearse in Berkeley – so every one from Marin had to schlep across the Richmond Bridge to come to rehearsals. We quickly found two leads – Melissa Anderson as the girl, and Mark Mendonca as the boy. 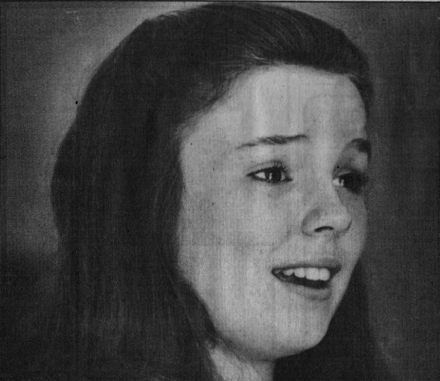 Melissa was a typical stage school kid: she’d just played Dorothy in Wizard of Oz. Mark was more rough and ready – but really got the environmental message. Melissa was bemused that there was no script when she arrived for first rehearsal. She was happy to sit and listen to the conversations about the issues with which every performance began. She was even OK to do a few improvisations – but not enthusiastic. She was basically waiting for some one to give her her lines so that she could learn them. She was a very talented young actress / singer so – though I was frustrated by her attitude – I worked with her, trying to nurture in her an interest in all matters to do with Nuclear War and the Soviet Union: I asked her to imagine what a girl of her age might be thinking / doing in the USSR – and got her to read Jonathan Schell’s book, “The Nuclear Winter” – so that she could get her head around the issue we were discussing in the plan. She came back after a week-end of research on these issues – and she was a different person. Suddenly, she understood why we were doing this play: it was not just an opportunity to show-case her considerable talent. It was an opportunity to get Americans thinking about how we could end the Cold War. Poor Mark was gobsmacked when, in an improvisation they did that day, she laid into him like a harridan on speed: she had all the answers and, in a pretty convincing Russian accent, laid them on Mark – to the extent that he was silenced. She ended up being brilliant. She was the 1st Peace Child to go to the USSR, played the lead in both the ’85 and ’86 tours – and was arguably the most effective Peace Child cast member of all time. Also in this show, we used Nina Gallen to play our 1st female US President. This was appropriate as Geraldine Ferraro was the 1st female vice presidential candidate – and a Democrat! We had a small chorus – and we performed on the Arts Stage at the Democratic National Convention Trade Show. Alan Cranston and – to our delight – Carole King, dropped by to see the show, along with Dharaj Maxfield from the Theatre of All Possibilities in Santa Cruz – whose contribution to Peace Child would later prove tremendous. See: San Francisco Album, – prepared by Zizi Mott, whose daughter played the Story-teller. This is one of the loveliest records of any of the US Peace Child shows. Look at the quotes above! Back then, it was much less common for teachers to ask children what they think – and, of course, when Peace Child did – the flood gates opened, and torrents of advice and opinions flowed into the play. 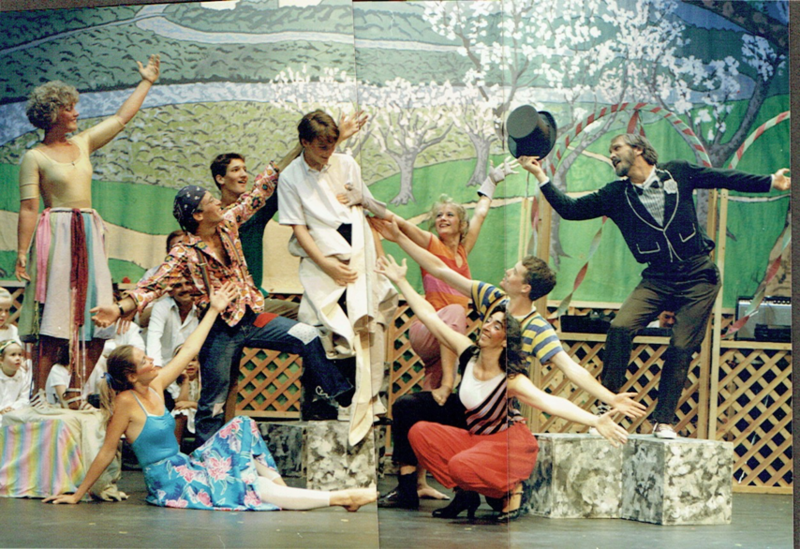 Sometimes – this was overdone, as in a famous performance in Ojai, California – where most of the cast spent the 2nd Act in floods of tears as they shared and improvised their opinions on peace, and how to create it. But the children and producers felt it appropriate for their community – and that was the thing: children and producers could create productions that fulfilled their own, and their communities expectations. We hadn’t seen this coming – but all of a sudden, Peace Child Chapters were emerging across the USA. Rochester, Santa Cruz, York Pennsylvania, TWO in Los Angeles!! It was amazing. And some – like the Theatre of All Possibilities in Santa Cruz were touring their shows, just as successfully as we were doing in Washington DC. Dharaj Maxfield had seen the show at the Democratic National Convention in San Francisco – and realised that his goals were precisely aligned with those of Peace Child. We were so fortunate that we had the talents of him – and of his great theatre company – to advance the Peace Child process and message up and down the West Coast. They also started a tradition – which was adopted by several other chapters – of celebrating the UN’s International Day of Peace. 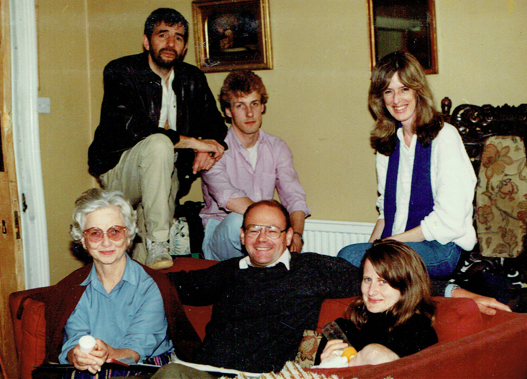 I had been commuting back and forth to Moscow since 1983 – establishing connections with the authorities, artists and theatre people – massively helped by citizen diplomats like Cynthia Lazaroff, Anya Kucharev, Vladimir Posner, Misha Shevelov, Stas Namin and others. 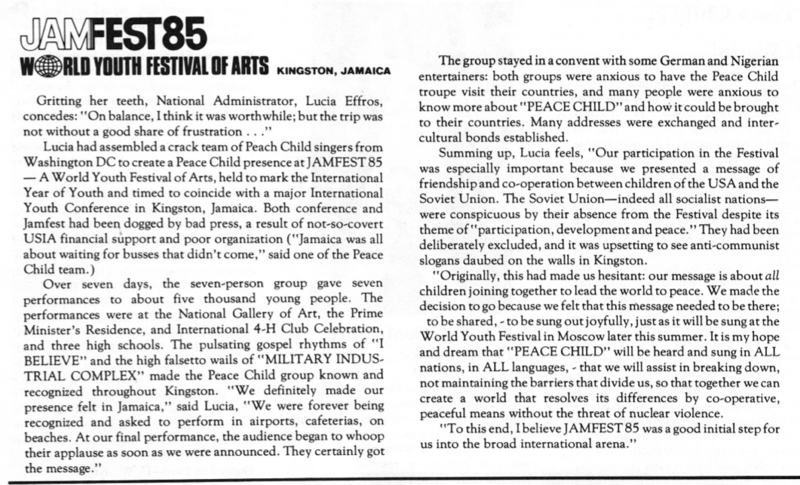 Together, we had hatched a plot to bring US Peace Child over to do a show as part of the Moscow World Youth Festival – a deeply socialist event which tried to bring young people together from all over the world to persuade them that the Communist system was the greatest thing ever! 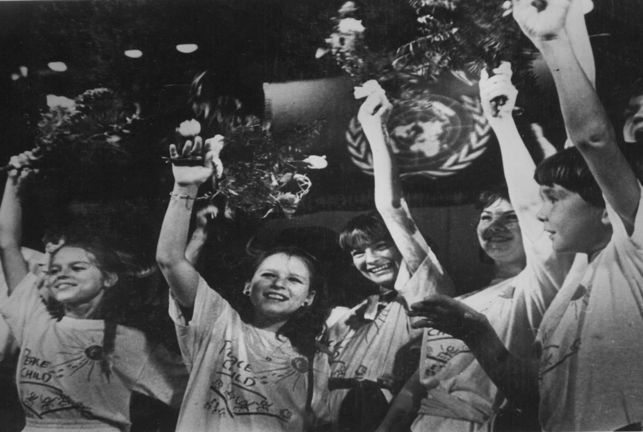 Both were propaganda exercises, but both would bring Peace Child to the world’s stage and, in the case of the USSR, fulfil the goal which – since our inception in 1981, we had dreamed of doing. When we got to Moscow, we incorporated the Russian children into the show – and Steve Riffkin and the Russian Band learned the songs – and introduced some new ones, particularly “Mwi Zhelayem Schastya Vam” (We wish you to be happy) – which the cast sang and recorded for Stas’s Festival Album – along with I have a Vision and Mr President. We ended up performing the show in front of legendary Russian poets, Yevgeny Yevtushenko and Andrei Vosnesensky at the famous Natalia Sats Children’s Theatre. 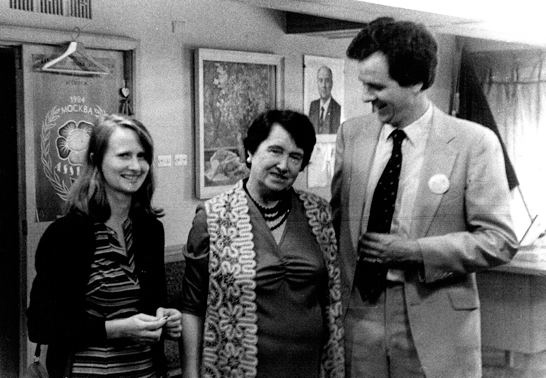 Natalia welcomed us personally – and, when Gorbachev had his big Glasnost Assembly with Yoko Ono, Norman Mailer and the rest, she invited me to come as her guest as a pioneer of Children’s Theatre. This was an astonishing privilege from the lady to whom Prokoviev dedicated his masterpiece, Peter and the Wolf. As I wrote in the newsletter: “The most thrilling part for me was that is was all so normal. Though, in many ways, children and musicians from the USA and the USSR walking out on stage together was as unlikely as children walking on the moon together, when it came down to it – they all learned their lines, rehearsed their moves, sang their parts and had a great time together on and off the stage.” The Russians audiences LOVED Peace Child and its songs – nowhere more surprisingly than at the Olympic Stadium when Sasha and Gwen performed the lyrical “I have a Vision” at the end of a punk rock concert by the German band, the Scorpions. I watched the the punk rock fans rocking out to every Scorpions’ song and feared that they would boo Gwen and Sasha off the stage. I couldn’t have been more wrong: they listened, spell-bound, tears in their eyes as the heavily pregnant Gwen sang her heart out – with Sasha supporting her with his powerful baritone. The whole audience stood as one at the end and cheered for fully ten minutes. “I felt excited and honoured,” said Gwen Ross – whose nerves and morning sickness evaporated as the waves of love and admiration flooded over her from the wildly appreciative young audience. It was while we were in Artek that we heard the dreadful news that Samantha Smith and her father had been killed in an air crash. Samantha was a figurehead for Peace Child: she had written to Chairman Andropov, asking him why he was planning to blow her, and all her friends, off the face of the planet. Andropov replied, and took the precaution of copying his reply into ABC, NBC, CBS and all other media channels in the USA. There was a collective harrumph from the US establishment – which the Soviets gleefully exploited by inviting Samantha to the USSR and showing her a great time with other Soviet children in Moscow, St Petersburg and Artek. When she died so tragically, of course, the Soviets wanted to do a ‘Telemost’ – which is what the Russians had been doing to bring together women’s groups, business people and other sectors of society. This paved the way for the Landmark Peace Child / PBS Space Bridge of December 2nd 1985. As though we didn’t have enough to do, we + the wonderful organising Team from the Ockendon Venture(below), took on the management of the UN Year of Peace Launch Event in the Albert Hall. It was an extraordinary event – as the report above shows. The Kodo Drummers from Japan were electrifying, and Sonny Ramphal, S-G of the Commonwealth gave the speech of the evening, winning applause for practically every line he spoke. Sadly, the video made of the event appears to have vanished – but we have the programme. It paved the way for the even bigger challenges of the Moscow-Minneapolis Space Bridge and the breakthrough US-Soviet Tour coming up the following year. All three helped Peace Child win the UN’s prestigious Peace Messenger award the following year. But the most remarkable thing about it was the presence of John Denver. The American cast members had re-united at a farm some 100 miles north of the city. And – when it came to drive back the night before the show, it was snowing heavily. We worried that we were not going to make it back on the Freeway – and that our entire cast would freeze to death in a snow-drift! Much worse – how on earth was John Denver going to fly in from Aspen – with the Airports all closed to commercial traffic? Sure enough, in the morning, we had a message from Denver’s office saying that there were problems landing in Minneapolis – but that, as it was a crystal-clear morning, he was still hoping to fly in. And fly in he did – arriving on stage at the Children’s Theatre about 3-minutes before the link was due to go live. No time for rehearsal – Nothing. Just go for it – and, supreme professional that he was, he was word perfect – and wonderful. And, at the end, he sat amongst the American kids and chatted about his beliefs on camera. It was a deeply moving moment. On Christmas Day 1985, the Space Bridge was broadcast nationwide on the PBS network – garnering an audience of millions. It didn’t raise the millions of dollars that we’d hoped – but everyone said that we were bad about asking for the funds. It was true – we were always lousy fund-raisers. But we kept working – and surviving, and affording the endless trips to Moscow. Christmas 1985 – with our new baby girl, and our eerie up in Painted Cave on the hill above Santa Barbara, was gorgeous. The photographs show the staggeringly beautiful position, looking down over green hills to the Pacific. It was a magical place to be – but hard work: I had to commute to Moscow as we now had the possibility of a US-Soviet Tour and to bring the first soviet youth and rock band to the USA on a Youth Exchange. Laurie Tucker had issued the invitation on the Space Bridge and, though the Soviets had cut the invitation from their broadcast – the fact that the show was repeated 7 times on Soviet Television, showed the Soviet authorities just what a fine propaganda tool they had in Peace Child. Still – the bureaucratic constraints to allowing Soviet children to tour a ‘decadent western musical’ to the USA remained formidable. It took the combined energies and creativity of Stas, myself, Vlad Posner and many others to figure out how we could do it. The key was to find a sponsor who was not part of the government. An ideal one would be the International Trade Center: if they wanted to promote a Soviet-American peace musical to boost trade, there was, in theory, nothing that the government or communist party could do to stop them. Also – in the era of glasnost and perestroika which was convulsing the arthritic Soviet bureaucracy – something like the Peace Child exchange programme was the flavour of the month – supported at the highest levels. Even so – as you will read in the attached history – it was touch and go up to the last moment. Meanwhile, the Lobero Theatre performance was cast and mounted – with considerable assistance from local troubadour, Chic Streetman. 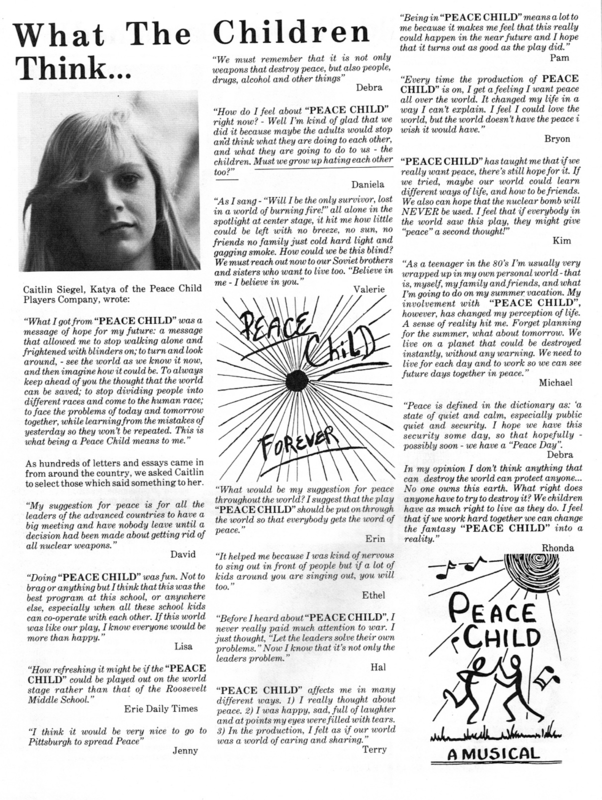 Chic’s wonderful Peace in the Heart song – a canon in 7 languages, became a staple of the Peace Child shows for ever after. It is a superb collective experience singing for peace in different languages all at the same time. Steve Riffkin came down from San Francisco to direct the music, and two new friends from the Space Bridge, Barbara and Howard Katz, flew in for the show. Lobero Programme Rosey, balancing Natasha on her hip, produced the whole show from a wall phone in the Kitchen in Painted Cave – while I was away in Moscow much of the time. 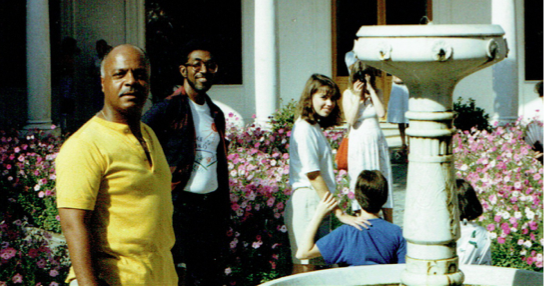 The person from whom we’d rented the house in Painted Cave came back just after we’d done the show and – as we hadn’t got anywhere else to go – we moved into a temporary home, first in the Trout Hatchery, then in Goleta close to where Alexander was going to school. As well as trying to produce the show in Santa Barbara, navigate the resistant authorities in Moscow, raise funds for the tour and keep our young family together, I was also working to jolly along the 12 x tour teams in the USA and Canada. We had a tour manager, Michael Lindeman, who scored an early success by raising $100,000 from Steve Wozniak – co-founder of Apple Computers. He helped enormously – but the faith of the hundreds of American men and women who supported the tour – while I was not at all sure that it would ever happen – was extraordinary!! We were used to being blessed with Miracles in Peace Child – but in planning the 1986 summer tour, we were stretching the powers of the Almighty perhaps a step too far! The whole story of the 1986 breakthrough tour, written up from my diaries of the whole experience + the funding proposal, the press reports, some of the thousands of photographs that were taken during it, can be found here. More photographs can be found here ( – which I am going to set to some of the Russian music used in the show. Right now it is a silent slide show.) The experience of the tour was distilled in this 13-minute documentary which was shown, endlessly throughout the USA and Soviet Union to drum up support for the subsequent tours – about 100 of which were organised between 1987 and 1994. Most of them used a variant of the Tour Script written for the 1986 tour – improved and adapted for the different provinces in Russia which our tours visited. The Archive and the Video will give you a sense of the joy and sense of achievement we all drew from the Tour – and what follows is just a brief impression of the story that convulsed our lives for ever after. It was the FIRST Soviet-American youth musical; it was the FIRST time a Soviet rock group had toured the USA. 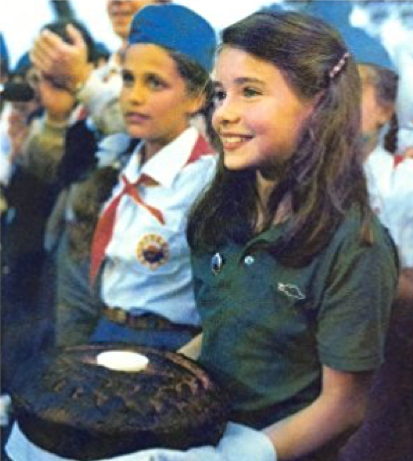 It was the FIRST US-Soviet reciprocal Youth Exchange – an effort that every one from the Scouts to the American Field Service had been trying to pull off for years; and it did set up the Peace Child Foundation as the world’s premiere youth / cultural exchange body dedicated to furthering people-to-people ties with the USSR. And – further – we had a political agenda: were dedicated to bringing down the Iron Curtain! July 1986 found me in Moscow waiting for the US Cast to arrive and suffering from the frustrations of not being able to phone or e-mail any one in the USA. Even fax was challenging! And there were almost no computers in Moscow! So – everything was being typed up on my Mac Classic or portable typewriter! We had found a Russian cast, and the Americans were set to join them on the Friday night to co-create a show! The Soviet Ministry of Culture had gotten in on the act – not in itself a bad thing as they could, if they wished, smooth several of the government obstacles that would stand in our way. But – it rather gave the lie to our show being a ‘cultural promotion for the Trade Centre!’ The Minister of Culture was supposed to see the show on the Thursday – not giving us much time to write, rehearse, prepare in Russian, an entire 2-hour musical. And then North-west Airlines let us down – with not one but TWO broken planes! This meant that the US kids did not turn up until late on the Sunday night, dog-tired – and with just 3 and a half days to prepare the musical. We had the rough plan for the show – but it needed a lot of fleshing out. And we had two directors – myself and Vladimir Alennikov, and a choreographer, Vlad Druzinin, who was not good under pressure. And pressure did not come much greater than getting a 2-act musical up and running in 3 days. But the kids refused to see the problem: they dived right in and, supported by an amazing team of Steve Riffkin, Tony Booker, and Stas himself, they pulled together the bare bones of the show – ready for 14.00 on the Thursday, when – spot on time – the Soviet Culture minister turned up. Now my memory differs from the story that I wrote – because I am sure that the Minister’s heart was melted by the show – and that he came and embraced the kids immediately after it. Maybe he didn’t – maybe it was later when he was saying good-bye to them. But – we do know that he was impressed and that, following the audition show, the Ministry of Culture allowed us to continue with the tour – and travel to Ulyanovsk and Artek. The tour itself is a blur in my memory: little snippets stand out. 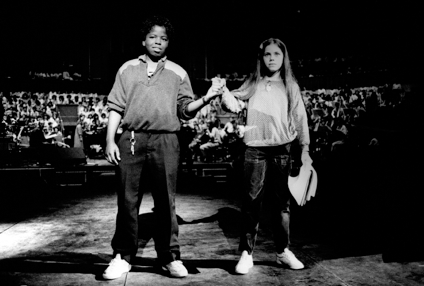 First – we all realised that we needed a better choreographer than the one we had – so we called up Mike Malone, the excellent choreographer of the original Kennedy Center show. And we got him a visa and a flight, but he couldn’t join us until Artek. So – he had to get a train from Moscow to Simferopol, and then a taxi to a bus-stop in Yalta – where I was supposed to meet him. And – being an African-American in the USSR was not a comfortable experience – and the lack of mobile phones or any way of reaching him easily was a nightmare. So when I came to the bus stop in a taxi at the appointed hour and found Mike, cowering in a door way, waiting for me – I was more relieved than I’d ever been that whole tour. Mike transformed the show – disciplining the whole cast, and tightening up the music and the dialogue. By the time we did our final show in Moscow, it was not half bad – and, heading out to the USA, we felt buoyant and confident we had a good show. The business of getting exit visas from the USSR, transit visas through the UK, and entry visas to the USA was a complete nightmare – and we didn’t know until the last minute who would get them. All that – and booking 21 flights for each person around the USA was a logistical horror story – but, somehow, it was all dealt with. And we got on the plane, travelled to London, had a great night out in London climbing on the lions in Trafalgar Square and arriving in York Pennsylvania, all set to conquer America. York PA was just the best place to start a tour. The Russians loved it – a small town on the edge of the Amish country with lovely people like Bill Schintz, the local photographer to welcome them.. America starts in Pennyslvania – and nowhere was that more true than our experience in York. An abiding memory is of the Russians and Americans dancing wildly to “YMCA!” – and the po-faced Russian Ministry man doing the ‘Funky Chicken’ with a fluffy chicken on his head. Slava, one of the young Russian cast members was asked on a TV interview in California which his favourite city had been on the tour: “York,” he said. “Oh, you mean New York…” said the interviewer. “No – York Pennsylvania. That was the best city…” The interviewer had probably never heard of it – but for all of us, York PA is seared on our memories as a happy, happy place. We had two or three days to re-write and rehearse the show in English – but that was easier as most of the Russians spoke pretty decent English. And Mike was working in his mother tongue – so he rose to the occasion brilliantly, tightening up the choreography – making numbers like Fireball and Reach Out sensational. And the Russian music was delightful – the Siberian folk songs sung by Sasha Malinin, and Eta Musica sung by the lovely story-teller, Ludmila Senchina, affirmed the beauty of the Russian Culture. We have a recording of the whole show from the Wilton Theatre, Los Angeles. It is introduced by US talk show host, Casey Kasem, Stas and myself and, though just a single camera shoot – you will get a sense of the vibrancy of the music, and the passion of the young performers. They knew they were making history and it shows in their commitment. Also, it reflects a golden moment in Peace Child’s history. 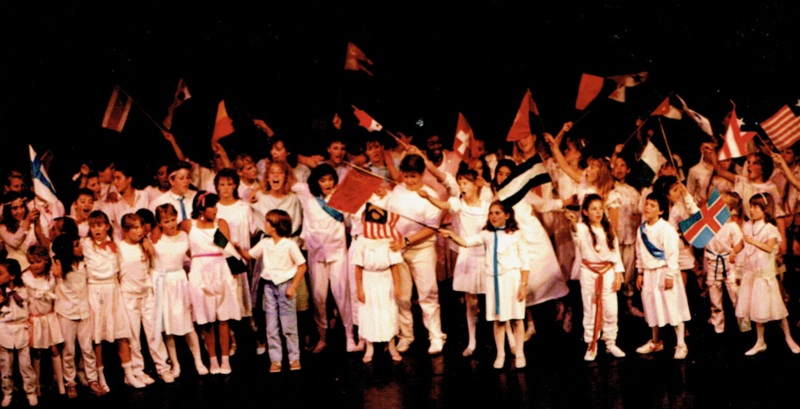 This was the first Soviet-American youth / cultural exchange – and it was not some dry, dusty seminar, or playful antics at a New England Summer camp, or some po-faced classical musicians playing a concert of music composed hundreds of years ago: this was young Russians and Americans having a great time together, singing and dancing their hearts out in a story that showed their commitment to a future of peace and co-operation. It’s only a little sad to reflect that now – 30 years on – the need for peace and co-operation is possibly even more necessary than it was then back in 1986.